Narrative design and dialogue for Dungeons & Dragons Online: Stormreach. Working on the city of Stormreach, its dungeons and wilderness areas and its various quests and raids gave me a great opportunity to create dozens of NPCs and names monsters, as well as to script all their interactions and dialogue. I designed the look and feel of DDO's loading screens and dungeon maps, wrote copy for the load screens and created the names and descriptions for over 100 items, artifacts and weapons. The kobolds of Stormreach were displaced from their ancestral homes by mysterious forces. Some tribes chose to strike out against the other races. Others prefer to live in peace and quiet. A dungeon where the goal is to lead a pack of mangy guard dogs back to the entrance without harming any of them. Heavy rains drove a swarm of spiders into the crypt containing the remains of Berne Jorn's ancestors. You must clear it out so he can enter and pay his respects. Laws forbid the creation of new warforged. Unfortunately, Phineas Hayward was never known for his law-abiding ways. My action-movie dungeon involving traps, puzzles, robotic servants gone mad and a "just in the nick of time" climactic explosion as the player escapes. One of my favorite quests. The player must travel into Orphne's memories and restore her sanity by collecting memory fragments. Whenever one is recovered, the memory is shown as a tableau. The ritual pilgrimage to the Vulkoor Spiral is practiced by many drow and scorrow. Its winding tunnels were supposedly formed where Vulkoor rested from the desert heat. I created this as a "reverse dungeon" where you enter at your goal and fight an avatar of a scorpion god! Then it's a race through the dungeon back to the start where you can escape. Raiyum kept an entourage of healers and herbalists by his side throughout his reign. 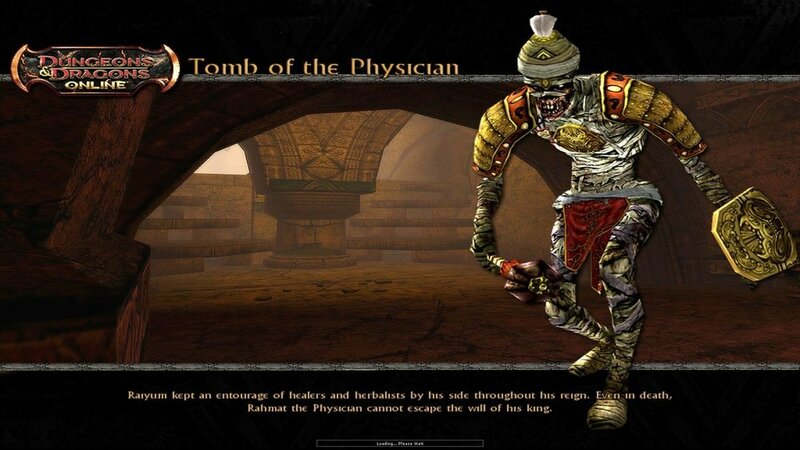 Even in death, Rahmat the Physician cannot escape the will of his king. One of two quests leading up to the Tomb of the Wizard King. Kourush the Astrologer was Raiyum's chief advisor. When the Wizard-King passed on, Kourush was entombed to serve him in the afterlife. King Raiyum once commanded a legion of soldiers from across the planes. His kingdom is buried beneath the sands, but Raiyum himself rests not so peacefully. This was an enormous dungeon full of random traps and encounters. My favorite part were the hieroglyphics you could decipher if your intelligence stat was high enough. Long ago, say the legends, a hero dared to oppose the cruel reign of King Raiyum. His remains are turned to dust, his crypt defiled, his true deeds forgotten. I loved this quest—a tale of vengeance and redemption. You must cleanse the tomb to restore a family's honor. Defeating the wraith at the end causes him to resume human form and he thanks you for freeing him from his curse. This quest takes the player on a trip through memory lane, starting in one of the low-level dungeons. A secret door is revealed and soon they're roaming through places and sewers previously visited in earlier quests. Radek and Froz are references to a friend of mine. Under the leadership of powerful creatures like the Ogre Magi, the savage ogres of the Restless Isles represent a dire threat to the peaceful peoples of Xen'drik. Inspired by Apocalypse Now, this quest has the player "sailing up river" to a compound run by a fearsome ogre magi. Favorite part: the Enter the Dragon-style scene of ogres training for battle. The Shrieking Mines are named for the winds that howl through its narrow tunnels, sounding like the cries of some tormented soul. Storm the Shrieking Mines and set the wildman miners free! You have to kill their overseers first or else they'll be compelled to attack you. Kill too many and you fail the quest.